The Pokemon Company has announced the final Legendary Pokemon distribution has kicked off for Pokemon Sun and Moon and Pokemon Ultra Sun and Ultra Moon players. Players can grab a code for either Legendary Pokemon Lugia or Ho-Oh from the Johto region. 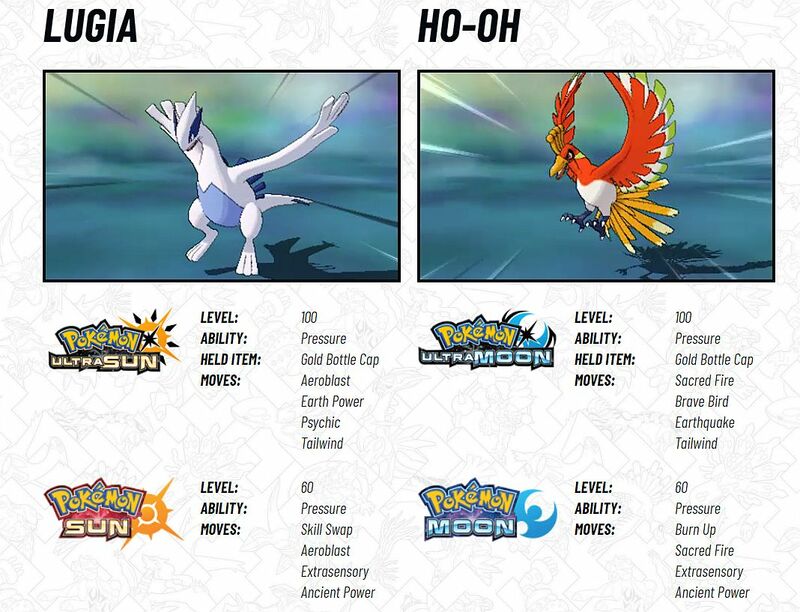 Ho-Oh is a Fire/Flying-type while Lugia is a Psychic/Flying-type Pokemon. Pokemon Ultra Sun or Pokemon Sun players will be able add Lugia into their game. Pokemon Moon and Ultra Moon players will receive a code for Ho-Oh. Stats for each Pokemon are posted in the image below. Open your Pokemon Sun and Moon or Ultra Sun and Ultra Moon game. North American players can pick up codes for either Pokemon at their local GameStop until November 25. Residents in the UK can get codes at their local GAME store, and in Ireland at GameStop by November 25. Previous 2018 Legendary distributions for Pokemon Sun and Moon were: October’s Reshiram and Zekrom, Latias and Latios in September, Kyogre and Groudon in August, Thundurus and Tornadus in July, Shiny Zygarde in June, Xerneas and Yveltal in May, Entei and Raikou in April, Regigigas and Heatran in March, and Dialga and Palkia were handed out in February. Hopefully you were able to catch them all. Don’t forget: Pokemon Ultra Sun and Ultra Moon players can also collect their very own Mythical Zeraora this month. In North America, GameStop stores are handing out codes until November 9. UK residents should visit their local GAME to grab a code by November 15.